It's always interesting to see how a design evolved … if possible to see how a designer tried and then rejected certain options to reach the final form for a design. It's part of that same process when you see designers, having reached one stage, then pick up an idea and take it on to develop a variation. 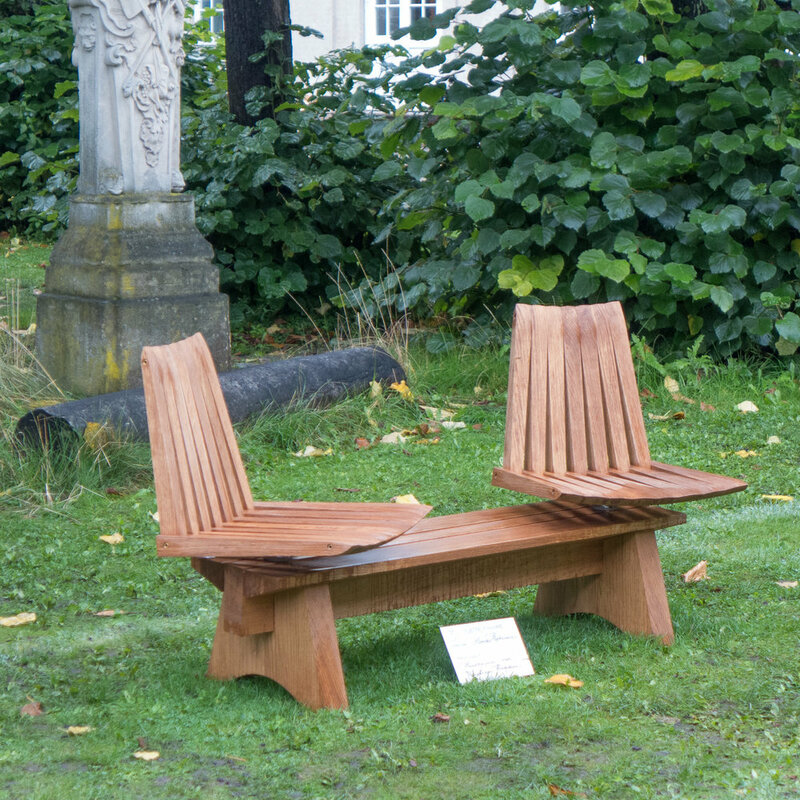 For the Cabinetmakers' Autumn Exhibition in 2017 - when the theme was Side by Side Out Side - Hannes Stephensen designed a pair of seats that were set on a hefty base like a low bench. With the title Flette Fingre, these seats had a distinct form with an L shape of tapered or wedge-shaped forming a seat and a backrest - a shape, as the name indicates, like interlocking your finger tips and holding your palms at right angles to each other - and this seat unit was held on a complicated but almost completely hidden steel pivot so the chairs, although they were fixed on a common base, could be twisted round so people could face each other to talk or tuern away from each other. That pair of seats was made by Kristian Frandsen and this year the same partnership has taken the same form of chair but made slightly smaller and they have developed the design and taken it on to a next stage by separating the chairs and setting each on its own cross-shaped base in wood and a short column that supports the metal pivot and the seat to make a stand-alone chair. With the title Piqué, the idea of a pair of chairs has been kept but one chair is in Oregon Pine and one in ash. In 2017, both the chairs were in oak. Side by Side was for furniture outside … the idea of that theme for the Cabinetmakers’ Exhibition was to design furniture that encouraged people to sit and talk. The exhibition was in the great inner courtyard of Designmuseum Danmark in Copenhagen and, as part of the exhibition, and developing that idea of conversation, the museum showed a number of filmed interviews with the designers and the cabinetmakers. The conversation between Hannes Stephensen and Kristian Frandsen was a revelation because it showed how their common enthusiasm and their obvious and very real passion for craftsmanship in wood drove forward the project. The design museum regularly uses films and video … both historic and contemporary … to illuminate aspects of the collection or the works of specific designers … the current show of design since 2000 in Dansk Design Nu is a particularly good example. It is to be hoped that these will be shown more widely if the museum can establish something comparable to the Louisiana Channel, the on-line site by Louisiana Museum of Modern Art. Lise and Hans Isbrand designed two pieces for MONO - the Cabinetmakers’ Autumn Exhibition at Thorvaldsens Museum … a low wide chair called Sunrise with shaped and curved seat and back rest in laminated wood supported on an elegant frame in ash and a low table with a circular wood top supported on a steel frame, that for fairly obvious reasons, has the title O-X. On the first day after the exhibition opened, there was a chance to meet Lise and Hans Isbrand and we talked about their work. They discussed the construction of the chair and were kind enough and patient enough to turn the chair over and turn it around so I could see how the frame is constructed and take photographs. It struck me that the chair and table are different in character and form but they explore similar and related ideas about construction ... they explore how you construct as thin and as light a support as possible … with one in wood and one in steel. Sunrise - the chair - has unusual and distinct features in it's design but is clearly in a long Danish tradition of cabinetmaking for furniture made from wood. The seat and the back of the chair are broad oval shapes in thin laminated wood or plywood that are curved in just a single plane and that is a form of chair that goes back to the 1950s - to shell chairs designed by Hans Wegner - but where chairs by Wegner either had a bold support that was also in laminated wood or had a robust frame in wood, often oak, here, in the Isbrand chair, the seat and back are supported on a complex frame that exploits the qualities of the ash that has been used for legs and cross members that are barely thicker than a dowel and form a complicated and elegant scaffold. O-X, the low table, also explores and experiments with the intrinsic characteristics of the materials … a large but thin disc in wood for the top is supported on a bent steel frame. The top is about 20mm thick but the edge, rather than being cut square, has a very precise and deep chamfer that makes the top, from a slight distance, look more like a disc of sheet metal. For the frame that supports the top, the design exploits the qualities of steel that is not just strong in itself but when bent into sharper curves than are possible with steam-bent wood it becomes even stronger as a support so it can either take a heavier weight or, as here, the parts of the supporting frame can be reduced in thickness. 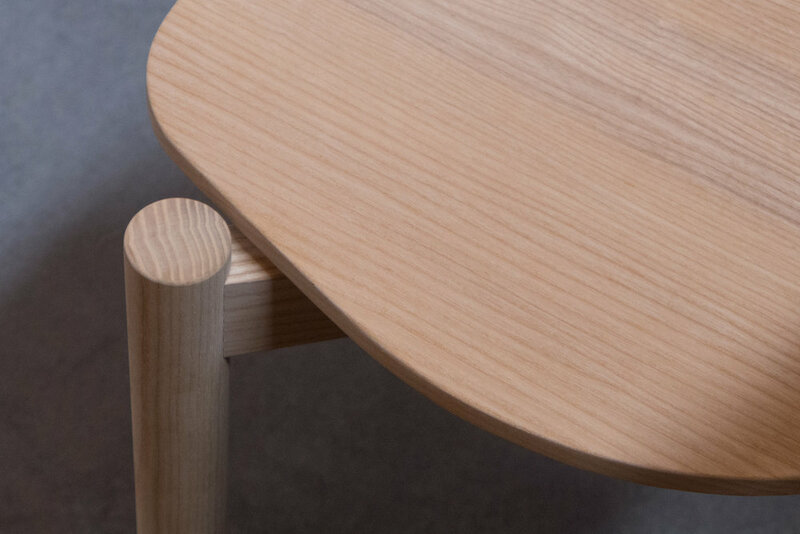 If the chair is firmly within the Danish cabinetmaking tradition … a tradition of making furniture in beautiful wood, unadorned, in a sharp and precise form of construction executed with real and very obvious skill … the table is different. It has a stripped back or pared down simplicity that reflects a specifically Danish form of minimalism. I suggested to Hans Isbrand that the table, in its style, looks back to the 1960s and was firmly put in my place. However, the use of metal for furniture, that actually goes back to the 1930s in Denmark, was strongest in Danish furniture in the 1960s but somehow has never really competed in popular taste with furniture in wood. Perhaps, this was because, without deposits of iron or coal, there was little steel production in Denmark or perhaps simply because making good furniture in wood was so well established in Denmark that wood was and still is what Danish buyers choose to buy. There are clearly great Danish pieces from the classical period of modern design that use metal - so the Super Elipse table by Piet Hein from 1964 or the chairs and tables with steel frames by Poul Kjærholm through the 1950s and 1960s - but even now there is much less furniture in glass and steel in a Danish furniture store than you would expect to see in Germany or France or Italy. The large oval-shaped seat and the backrest of the chair are in laminated wood or plywood that are curved in just one plane and rest lightly on a thin and elegant framework or scaffold in ash. Ash has a straight and regular grain and this is exploited in the construction with the parts of the frame turned and reduced to a small cross section so the pieces are barely more than the thickness of a dowel. For a framed chair in wood the simple and common form has a square or circular frame that supports the seat with, normally, two legs at the front, often but not always housed into the underside of the frame, and with two legs at the back that continue above the level of the frame to support a piece of timber for a back rest that is set either vertical or at a slight angle for more comfort and is either between the upper parts of the back legs or fixed across the front of the two uprights. To keep the legs in place the next stage is to add stretchers - lengths of timber between the legs to stop them splaying out and if stretchers are added then the timber of the legs can be thinner. It doesn't really have to be spelt out like that here except that it shows just how many of those conventions the Isbrands play with and subvert to create such an elegant framework of wood to support the seat and the backrest of their chair. 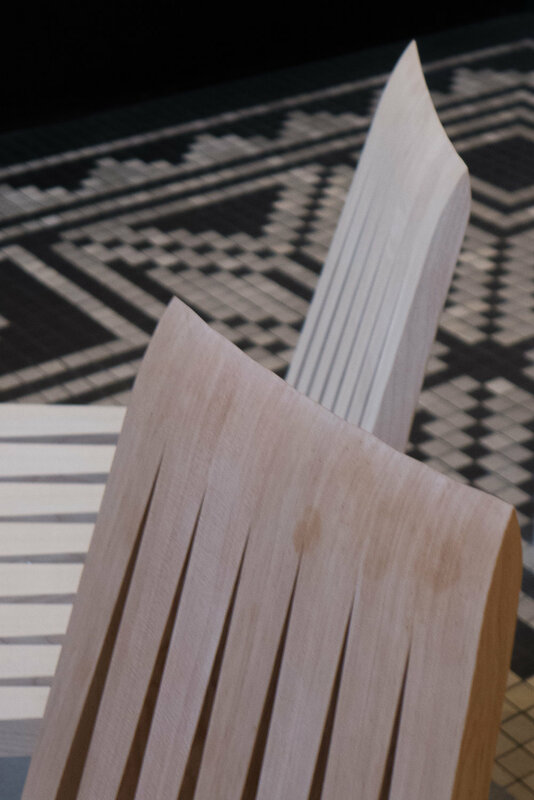 In Sunrise the tenons are rounded off at the top and bottom to form an extended oval shape and there are two wedges in dark wood to keep the tenon from pulling out so this becomes a strong decorative feature of the chair frame. 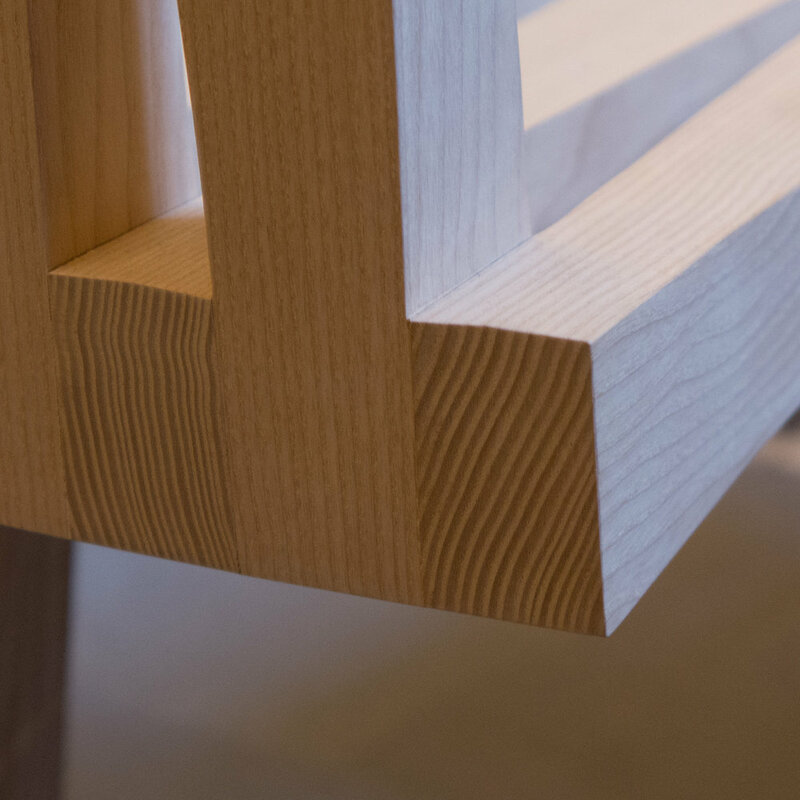 The tenons do not have a pronounced shoulder but there are hollow curves back from the joint itself to make the transition from the tenon to the full thickness of the timber. The frame is complicated. Perhaps the most conventional part is the front frame with two vertical legs with two stretchers - one just below the top of the legs and a second stretcher just below that. The two back legs are set out at a pronounced angle and do not support the back rest directly but are housed into short verticals that support the back rest and are rather like props. The two vertical supports for the backrest do not run down to the ground but are housed into long raking struts that run from the top stretcher between the front legs angled down and out to the back legs. The laminated seat rests at the front on short collars or spacing pieces housed into the top of the upper stretcher and the back of the seat is supported on short brackets out from the lower part of the struts that support the back rest. Again, as with the front of the seat, there are short spacers between the struts and the curved back rest. To stop the back legs moving outwards there are low stretchers, just above the ground, between the front and the back legs. There are very nice details to the frame like the deep cups shaped out of the tops of the legs. Rather than having upholstery or a cushion for the seat there is a simple round hole cut through the laminated wood that is closed with halyard taken from side to side, woven by threading the rope down through small holes drilled around the opening. This is a simple circular top on four short steel legs but those legs are not fixed into the underside of the top and are not part of a frame on cross struts immediately under the top but are set outside the rim with the top of the legs bent in a relatively sharp curve inwards and inserted into hole in the rim where they are held in place by a grub screw from below. At the floor, the legs are linked by cross piece to the leg diagonally opposite. These X pieces might have met at the centre but they are arched upwards but each with a different curve so one crosses over the other. The edge of the top could have been cut to form a simple flat face or could have been given a rounded profile but is undercut with a sharp chamfer. Wood cannot be cut to a thin sharp angle but here the vertical at the top edge of the chamfer is as thin as possible and that makes the top, for its size, very elegant. This chamfer could have been stopped square or angled off but is swept down and then back up to form a vertical where the top of the leg goes into the top of the table. They are held in place by small grub screws. A large but elegant and deceptively simple but sophisticated table. A compact and robust chair that has an unusual form of construction and proves, as always, that although a design may appear to be simple, the best simple - as here - takes a lot of work to get right. 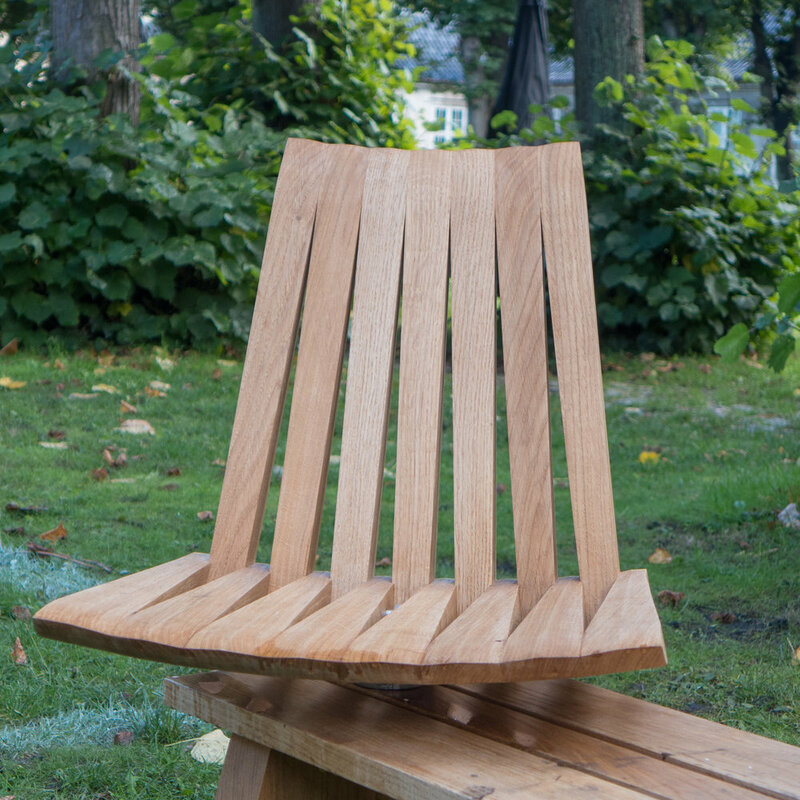 It has a relatively thick seat in solid wood - so not with a frame - but the edge is undercut with a deep chamfer that disguises that thickness and also creates a sharp crisp line to the front edge when you see the chair in profile. The seat also has a complex shape that is a semicircle for the back half but combined with an elongated half of a hexagon to the front. The seat is supported on an X with two cross pieces that are halved one over the other. These cross timbers are higher than they are wide and are cut away at the centre so that the solid seat drops down into the cross rather than sitting on top of it. Each of these cross bars is housed directly into the turned legs … a shorter front leg at one end of the cross piece, with the mortice of the housing just below the top of the leg so that it stands just proud of the horizontal cross piece, and a back leg at the other end with the housing for the cross bar at the centre of the leg. That X - of the cross shape underneath the seat - is not regular with the crossing point closer to the back of the chair than to the front so, with unequal arms, the back legs are closer together than the front legs. A kidney shaped back rest, in thin but solid wood, is gently curved and appears to be in two parts with the grain arranged symmetrically about a central horizontal axis. It is fixed an angle for comfort by cutting a flat face at the face of the upper part of the back legs. The legs are set vertically, rather than being splayed outwards at the ground to make the chair more stable. Generally vertical legs indicate a simpler and more straightforward chair - a feature associated with country chairs made in a local workshop - and legs that are set an angle that require more precise and more complicated mortice and tenon joints are used to indicate that a chair is more sophisticated. So one definition of a country chair is that it made in the workshop in a traditional way … barely needing thought and certainly not needing design but each slightly varying from the next as the carpenter responds to differences in each piece of wood. Although Introvert position might look like a simple country chair, it actually has carefully-determined and, of course, beautifully made with considerable precision. This is a deceptively simple but very clever design - like a child's drawing of a chair or a cartoon drawing of what a chair should be like - a chair that should be in a Walt Disney cartoon like the Sorcerer's Apprentice - but beautifully realised in wood. With rounded corners and rounded edges it's the very opposite of thin and elegant so it is somehow comforting and it brings out the soft, warm and almost gentle, qualities of good oak in a way that is found too rarely in modern furniture. The seat is solid and not round but squarish with strongly-rounded corners and the edge of the seat is rounded off with the most pronounced rounding on the top edge rather than it being a symmetrical moulding or being undercut. The four legs are robust and turned - so round rather than square in section - and tapered - so wider at the top and narrower at the ground - and the foot is not cut square or flat but also has an obvious rounding. The legs are set directly into the underside of the seat but into blind mortices * and they are angled outwards slightly for stability. Because the legs are relatively thick, stretchers that are necessary in lighter and thinner chairs to stop the legs splaying out or twisting, can be omitted here. The back rest is substantial and sharply curved - in the horizontal plane - embracing the back of the sitter but is not in plywood but is cut from oak and again is given a softer, smooth shape with rounded corners and rounded edges. It is supported on four robust flat splats - rather than turned spindles - and again the edges are smoothed round and, like the legs, these splats are held in place with tenons in blind mortices so no distractions from anything as complicated as a peg or a wedge. Maybe it sounds silly to say this but it seems to be a deliberately unpretentious and an amazingly open and friendly chair. To use a phrase normally associated with candles - this is hyggelig. * In simple furniture, particularly in what is often called country furniture, the most common way to fix turned legs to a solid seat is to cut a round tenon at the top of the leg and, with a hole completely through the seat as a mortice, the tenon is held in place by cutting a slot down through the tenon and once the leg is in place, the tenon is expanded by driving in a wedge from the top. The strength of the leg depends on the precise and sharp cutting of the mortice and the shoulders of the tenon. What you notice first about this chair is the striking colour. It's not paint, because you an see the grain clearly but it's not stain … the chair is made in hardwood from a tree of the genus Peltogyne that is native to South and Central America and is known, for fairly obvious reasons, as Purpleheart because the heartwood turns a deep purple after the timber is cut. But it's not just the colour that is unusual. The chair has an unusual form that was inspired by a work of the German artist Joseph Beuys that is now in the Neue Staatsgalerie in Stuttgart. It has a solid and relatively thick seat in wood with four turned or round legs that are slightly tapered - so thinner at the floor - and set just in from each corner but with a pronounced splay outwards at an emphatic angle to make the chair stable. These legs are fixed with a round tenon that goes through the seat and is held in place by a wedge driven down into the tenon from above. So … so far fairly conventional. But the chair is rectangular - much deeper than it is wide - with a back rest fixed across the narrow end … well a back rest if you sit astride the chair with your back against the rest or it is a single arm rest if you sit on the chair as if it is a bench. This backrest / armrest is shaped rather like a staple or perhaps more like a squared-off and simplified version of the Greek letter Pi [ π ] with two uprights in turned wood and a straight but tapered cross bar linking the two at the top. This is dropped down into deeply-curved vertical grooves or channels on each long side of the seat - just in from the corners of the narrow end - and down and slightly inwards to cross over the legs - again running through rounded vertical channels but here cut in the legs - and stop short of the floor. At Thorvaldsens Museum in Copenhagen, in November and early December this year, there was a major exhibition of furniture by cabinetmakers. This was MONO - the Snedkernes Efterårsudstilling or Cabinetmakers’ Autumn Exhibition. Generally, these pieces are not in production and many were designed specifically for the exhibition as it is an opportunity to try out ideas or use materials in unconventional ways that might not be obvious for a commercial manufacturer and designers find ways to highlight the skills of the cabinetmakers. There are photographs here of the forty-one works shown along with basic information about the materials and dimensions but many of the pieces deserve longer individual posts. Stools with an X-shaped frame have a well-established place in Danish design - the display of chairs at Designmuseum Danmark has nine stools of this form. Most of these stools are folding stools with two frames that are pivoted or hinged at the centre and open out or fold out to form an X shape that supports a seat that is often canvas but can be leather or slats of wood from side to side across the top. Here, in the stool designed by Steen Dueholm Sehested, there are two pieces - each a complex C shape, with the wood not a constant thickness but thicker at the centre and tapered or thinner towards the top and bottom and curved in both planes with slots cut into them so that they can be slotted or linked together. The C shapes cross over, curve back and cross over again so the base and the top on each side are part of the same piece to create an elegant and sculptural form. Such complex curves could not be formed from single planks but are made up with finely-cut and joined blocks with the grain forming a part of the design. The side pieces do not sit square on the floor but the bottom edge is champfered and cut to a sharp curve so the stool has just four points of contact with the floor. The Spanish Chair designed by Børge Mogensen was first shown in September and October 1958 at the Cabinetmakers’ Guild Exhibition at Kunstindutrimuseet in Copenhagen - now called Designmuseum Danmark. Produced by the Danish furniture company Fredericia - they are now celebrating its 60th anniversary. Louisiana - just up the coast from the city - had only opened that August. Even reading the criticism several times, and having typed it out, it’s not clear if this is praise or criticism. Of course, it’s ironic that Børge Mogensen, is being damned here, apparently, for designing furniture that the average citizen could not afford, because he was and is best known not just as one of the great designers of his generation but through the 1940s as the head of design for FDB - the Danish Coop - when they produced well-designed modern furniture of a high quality and at the lowest price possible. For the exhibition in 1958 the set of Spanish chairs were made by the cabinetmaker Erhard Rasmussen but the design was then produced by the Danish furniture company Fredericia who still make the chair. To mark the anniversary of the Spanish Chair, Fredericia have relaunched the dining chairs, with and without arms, that were designed in 1964 that have the same form of set and back rest with leather stretched across the frame and held in place with large buckles. 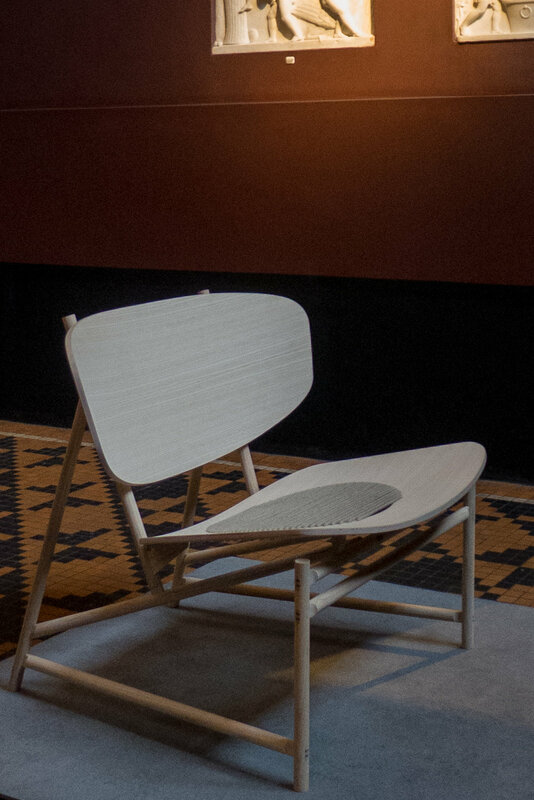 An important exhibition of recent work by the furniture designer and architect Else-Rikke Bruun has just opened at the gallery of the Association of Danish Crafts and Designers in Bredgade . There are several strong themes running through the works shown here but perhaps the most interesting and surprising idea is about not just defining space but also exploring shadow as a strong component as if it is itself a material element in the design. Five screens in wood - the main works - define space but also occupy space and very considerable care was taken to set the lighting and to use the natural light of the gallery so strong shadows on the floor dissolve the sharp edge between the vertical of the screen and the horizontal surface of the floor and views through the screen and light coming through the screen from the other side change as you move round the space. After completing her training as an architect Else-Rikke Bruun studied Arabian architecture for three years and here not just the fragmenting of light but also the use of precise geometric forms show the influence of Arabian architectural forms. Walking around the exhibition Else-Rikke explained that she is fascinated by patterns and the way we look for patterns and geometric pattern has a strong role in architecture of the Middle East, North Africa and southern Spain. Influence from Japan is acknowledged both in the way the screens and the arrangement of faceted blocks of wood in the chair and in small panels reference the Japanese art of folding paper - two panels in wood are titled Origami panel - but also there is the sense of a Japanese aesthetic in the calm and measured division of space - a key feature of the way the pieces have been arranged in the gallery. All the works shown are made with incredible precision so they also have the quality of fine engineering - particularly in the way separate pieces are linked or joined together or have different forms of hinge: all the screens can be articulated to adjust the angles of the parts or the alignment of the whole screen and Knitted wood folds back in on itself. Another strong theme is inspiration from textile art and that is shown directly in the titles of three of the works … Stitched wood, Massive weaving and Knitted wood. This is not just about how elements interlock - Veneer has what are in fact giant warp and weft in cut plywood - but, as with woven textiles, the visual character from a distance is different from the complexity and subtlety that is revealed as you move closer. Four of the works exploit the properties of laminated wood and develop different techniques for cutting to shape, bending, linking or interlocking plywood. Use of colour is important but generally subtle … the screen titled Massive weaving uses spray paint so colour is strong on the cross-cut ends of the battens but fades out along the length. This work was developed with the colour artist Malene Bach. Generally subtle except that Knitted wood has a strong colour on one side that counterposes the shadow as you look through the interlocking curves. The exhibition is the culmination of over a year of work specifically but actually develops and builds on themes that were first shown by Else-Rikke Bruun in the craft Biennials in 2015 and 2017. Immediately before the exhibition Else-Rikke Bruun had a residency at Statens Værksteder for Kunst / Danish Art Workshops in Copenhagen and in a longer review here both the development of the main ideas and themes of the exhibition and the role of the workshops in giving artists access to space and equipment to realise their work will be discussed. Stools in Oregon pine were made by Anders Petersen Collection & Craft in Copenhagen. Karmstol, the chair in the exhibition, took, as a starting point for its design, round-headed niches at each end of this gallery. It is not strictly site specific but does hint at just how carefully-considered this work is with strong references to the design of Classic Danish chairs while experimenting with both form and construction techniques. It is an important piece that blurs our artificial boundaries between art, craftsmanship and utility and will be the subject of a separate post. This is an interesting chair because rather than forming a plywood shell, it uses laminated and moulded wood for the chair seat and the back rest that are supported between frames of laminated and bent beech in a form but not a style reminiscent of the chairs by the Finnish architect Alvar Aalto from the 1930s. The Ax series that included a number of chairs and tables was some of the first Danish furniture to be made after the War that was aimed specifically at the export market. Many of the pieces were designed so that they could be packed as parts and then assembled at the destination and in the 1950s furniture made in Denmark in more expensive woods such as teak or mahogany tended to be exported rather than sold to the home market. Two chairs were made in this form - one narrower, the height and width for a traditional dining chair, and this design wider and lower as an easy chair. Both had the distinctive feature of paired stretchers set parallel, one above the other, both between the front legs and between the back legs. These stretchers are turned - round in cross section, slightly tapered and shaped at the ends - and brace and hold together the two side sections of the frame. Those side frames are strong enough for the stretchers to be omitted. The form of the bentwood side frames is important as Hvidt and Mølgaard-Nielsen developed a specific method of building up layers of laminate around a solid core - in mahogany or teak - rather like the way the handle of a tennis racket with a wood frame is joined to the laminated loop of the racket head. The most distinct example of this type of lamination is for the chair they designed for Fritz Hansen in 1959 - the FH6135 - where, to describe it crudely, four V-shapes in laminated and bent wood are fixed together around a solid diamond-shaped core to form an X that is the side frame of the chair. A triangular core in solid wood and the laminate bending and curving away on either side can be seen clearly but in a rather more subtle and rather less decorative way at the top of the front legs of the Ax Chair. This detail contributes to the flowing or unbroken lines of the side view that is a distinct feature of the design. Note the way that the bottom edges of the side pieces for the seat are slightly chamfered across the front and this chamfer runs down unbroken into a curve that runs back under the side piece and then down the front leg just at the point where the fingers of a person sitting in the chair would grip the front edge of the seat as they are transferring their weight and standing up from the chair … a small but good example of ergonomics, careful design and high-quality manufacturing coming together in a carefully thought through detail and, in part, reflects that both designers trained as cabinet makers. The front of the legs is not flat but they have a slight convex finish that in part shows the quality of the work but in part also makes a virtue out of a necessity because with laminated wood it is actually better not to try to achieve a crisp sharp angle to the edge or have a square-cut end to a piece as that can split or break away in use or with knocks or damage. In the Ax Chair the arm rests are distinctive. A chair from the 1930s designed by the Finnish architect Alvar Aalto had a similar form of arm rest with what appears to be a slit cut through the wood and the seat bent down in an L shape to follow the seat and back but the outer part bent up to form the L shape of the arm rest - a horizontal part for the arm and elbow and the vertical part running back down to the seat - but in the Aalto chair that was all done - seat, backrest and arm rest - in a single piece of plywood whereas here it is the bentwood beech frame that is split and shaped. In some books, the design of the Ax Chair is dated to 1947 but dated 1950 for the first production. With the separate moulded seat and moulded back, in laminated wood, the design echoes the type designed by Charles and Ray Eames in the 1940s although the chairs are obviously very different in style. The Ax chairs seem somehow more traditional and more tightly controlled - more conservative - in comparison although they were certainly successful in terms of sales. 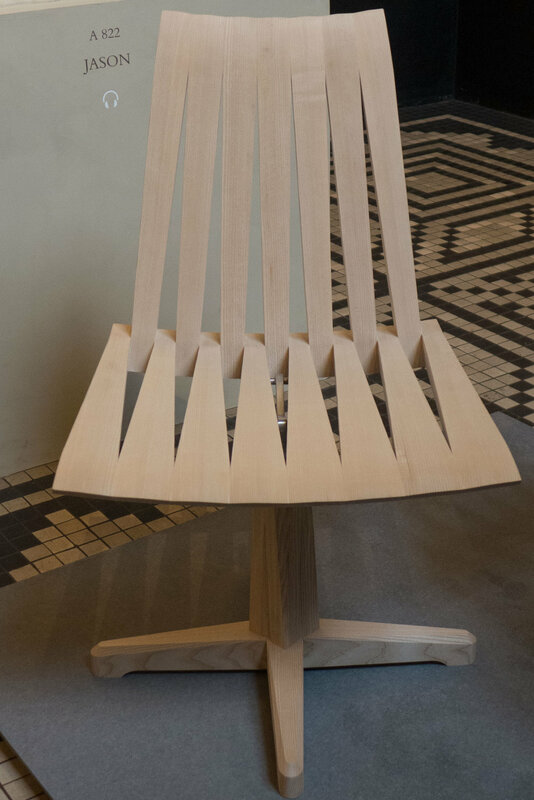 The Trinidad Chair is one of the most distinct and most unusual of modern Danish chairs made in plywood. It was designed by Nanna Ditzel and was given that name because the fretwork of facades in Trinidad, seen by her on trips to the island, had been the initial inspiration for the design. It has a low, simple but elegant frame in metal tube and the seat and the back rest of the chair are cut from separate pieces of laminated wood that are both in a fan shape that is almost reminiscent of the shape of a segment of a citrus fruit. Both backrest and seat are cut through with precisely cut slits that are fanned out gently across the shape. Both the seat and the back rest are fixed to the frame with large flat rivets but what is striking is that the metal frame of the back is not taken across the top of the back rest but is set low and holds the bottom edge of the back rest to give the chair a form of construction and a silhouette that has a lightness and elegance that is unique in Danish chairs. There are versions of the Trinidad with arm rests and options for an upholstered pad for the seat. Made by the Danish furniture company Fredericia, the chair came originally in a number of wood finishes including maple, cherry, beech, birch and walnut but there are now options for colours for both the wood and the metal frame and the chair has just been released in new colours - a palette of soft warm greys selected by the Swedish design blogger Pella Hedeby - to mark the 25th anniversary of its launch. Looking through recent posts on this site about Danish chairs from the 20th century a major and obvious omission from the list are the shell chairs in laminated wood that were designed by Arne Jacobsen in the 1950s. It was an amazing and productive decade for the architect when he was working on major buildings but still designing housing. Work on Munkegård Elementary School in Copenhagen started in 1951 and was completed in 1956; the Town Hall in Rødovre was completed in 1956 and the Town Hall in Glostrup was completed in 1959. Jacobsen designed major commercial and industrial buildings in this period - including an office building for A Jespersen & Son in the centre of Copenhagen - where work started in 1952 and finished in 1955 - the Christensen factory in Aalborg and a pharmaceutical factories for Novo Industri A/S in Copenhagen and for a new site at Bagsværd to the north of the city centre and from 1955 through to 1960, Jacobsen was working on the SAS Royal Hotel in Copenhagen. He designed several major housing schemes in that same period with both the Alléhusene housing complex and the Jespersen row houses built in the area close to the railway station at Jægersborg - a growing suburb in the north part of Copenhagen where Jacobsen had designed housing in the 1940s - and there was a second phase of building on the coast at Klampenborg - with the Søholm houses built just south of the Bellevue theatre and the Bellavista apartments that Jacobsen had designed in the 1930s. For prestigious public buildings Jacobsen designed specific, custom-made, furniture but he also worked on more commercial designs with a growing demand for modern, well-designed furniture for the home. Jacobsen designed a series of shell chairs in laminated wood in collaboration with Fritz Hansen - the well-established Danish furniture manufacturer - that could be used in commercial and public buildings but were also increasingly popular for use in ordinary homes. These chairs included model FH3100 known as the Ant Chair that was designed in 1952; model FH3102 or The Tongue - a small chair for children designed originally for Munkegård School in Copenhagen but later made in a larger version; from 1955 model FH3105 - another chair produced for Munkegård - and from that same year model FH3103 with a more pronounced curve between the seat and the back with a broader and deeper and squarer upper part to provide better support for the lower back and the shoulder blades. The Series 7 - model FH3107 - the most famous of these laminated chairs - also dates from 1955 and is still the best-selling chair produced by Fritz Hansen. Then, last in this series of shell chairs, the Grand Prix - model FH4130 - designed in 1957 and made in several versions. The form of these chairs - with a moulded shell in laminated wood - divides them - visually and, in terms of construction and manufacture, into two distinct parts with a seat and back to the chair in one material - the shell in laminated and moulded wood - and a base or support that was made separately in another material. and - most unlikely of all - the simple and compact shell of the Tongue chair, designed initially as a chair for a child, was upholstered in leather and set on a high fixed metal column with a swivel mechanism for a bar stool at the SAS Royal Hotel. These chairs are deceptively simple but, in production, the moulding process presented challenges. The chairs that were designed by Alvar Alto and manufactured in Finland from the 1930s were the first Nordic designs to exploit the properties of laminated and moulded wood in the commercial production of furniture. The layers of wood veneer were curved into different forms under pressure so the shape was 'remembered' when the wood was taken from the press but although those chairs by Alto had the seat and back from a single piece of laminated wood, the curve was in one plane so that it formed, in effect, a scroll. Trying to mould the laminated wood into more complex curves, either hollow or convex and in both directions across the shell, Fritz Hansen put the material under considerably more stress. On that last point, the first version of the Grand Prix had four L-shaped and moulded leg pieces stuck to the underside of the shell with a glue developed for that purpose but, I presume, under stress, the glue delaminated the facing layer of the shell so in later versions the design was changed to a cross-shaped and self-supporting framework of legs that was fixed to a plywood plate at the centre of the underside of the seat in a similar way to the fixing of the metal legs. For comfort, there must have been extensive trials to adjust the flexibility of the shell and the strength, weight and flexibility of the legs or base - particular where the chair has legs in thin bent tube metal. Too flexible and the chair would feel unstable but too rigid and it would be like plonking down on a park bench. The chairs also use rubber spacers or buffers set further out from the centre fixing plate to hold the legs free of the shell; provide some control to the flexibility of the shell and also stop the legs torqueing or twisting or shifting round. The view of the underside of a Series 7 Chair shows just how complex and how subtle the design of the shaping of the metal legs is with the cross pieces of the legs under the seat protruding beyond the edge of the seat - so that the chairs could be stacked - and with the metal curved downwards towards the centre to follow the shape of the moulded seat rather than sitting against it. The legs are also angled outwards - rather than being set vertical - which in part makes the chair appear lighter and more elegant - strictly vertical legs can look basic or stolid - but also provides extra stability for a light chair. There is an interesting but more general point about the shell chairs designed by Jacobsen and made by Fritz Hansen. We are now so familiar with major Scandinavian design companies like Muuto or Normann producing chairs with a range of bases and a range of colours and covers along with options for plain shells or upholstered versions, that we no longer see that as unusual - or, actually, we take that for granted because we expect a number of options when choosing a design. Before these chairs were produced by Fritz Hansen in the 1950s, chairs were designed as a complete or self-contained entity with production in relatively small numbers but, if there were options or variations, it might be that a different material could be used for the frame - so asking for a chair to be made in mahogany rather than oak for instance - or would be limited to selecting leather rather than textile for an upholstered chair. At most, the scale of a chair might be adapted for a later version so Rud Rasmussen produced the Red Chair designed by Kaare Klint in a smaller size as a dining chair where the original, was wider with more generous proportions, designed for the meeting room at the Design Museum. Chairs like the Thonet Chair from Austria, produced through the second half of the 19th century, was made in large numbers and was made to be transported in parts and assembled on delivery but that was unusual and there were different models or different styles but no options within each type of chair. Several of the chairs designed at the Bauhaus were conceived as relatively cheap furniture of a high quality of design for a large market but politics and events overtook their wider marketing and Alto, through the company Artek, certainly understood the commercial potential of marketing and international sales but it was the American company Herman Miller, marketing the designs of Charles and Ray Eames, and Fritz Hansen marketing the designs of Arne Jacobsen who really established the potential for large-scale production of well-designed furniture in the years through the late 1940s and the 1950s. Shell chairs for the SAS Royal Hotel in Copenhagen - including the Egg and the Swan - were designed in this same period - in the mid 1950s - but were made in foam and upholstered so presented different problems and resulted in a very different aesthetic so they will be the subject of a separate set of posts.